During the busy High Holiday season, crafting thoughtful presents for those we care about might be low down on our to-do list. Yet presents and chagim go hand in hand. On Rosh Hashanah, the extra effort is worth it. There is always a beloved family member, school teacher, dear friend or an earnest mailman thankful to receive a token of appreciation. I am a believer in simple homemade gifts that are easy to throw together but impressive nonetheless. In my experience, little gourmet treats are universally popular. The same DIY care package can be used for most people on your list or guests at your table. The following three DIY food crafts—Roasted Nuts in Honey, Honey-Infused Whisky and Israeli-Style Turkish Coffee Mix—are delicious and deceptively easy. The honey treats celebrate the sweetness of the New Year while the coffee mix, a specialty of the Northern region of Israel, is an rich counternote to all that sugar. Feel free to incorporate your own touches. Artfully packaging the crafts and adding a handwritten holiday greeting and instructions for use will put these gifts over the top and allow you to personalize them to each guest accordingly. Simply pour honey over roasted mixed nuts and not only do you have a beautiful gift, but also a delicious spread that will bring New Year sweetness to your dessert table. Guests who have a sweet tooth can schmear it on a piece of honey cake or a slice of challah. In my house, we like to add the honeyed nuts to smoothies to lend natural sweetness and extra protein, but we have also been known to eat them straight from the jar. Nuts keep for one year. 8-ounce canning jars that have been washed in warm soapy water and thoroughly dried. For each 8-ounce jar, expect to use 1 cup of nuts and a little over 1 cup of honey. 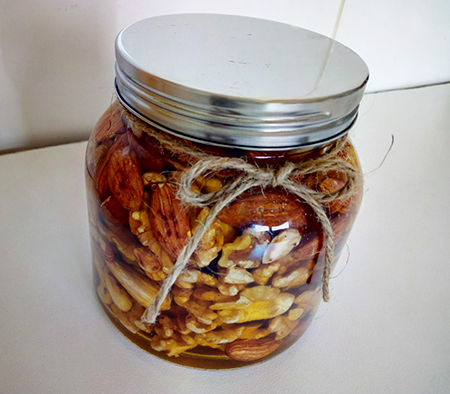 Pack roasted nuts down into the jar, filling it to the top. Pour honey over the nuts a little at a time, letting it fall and settle in the jar before adding more. Continue until the jar is filled to the top with honey, then secure with a lid. Makes just shy of 2 liters. This honey-infused spirit is a little sassy and a lot easy, and the result will genuinely wow anyone lucky enough to taste it. The sweet liquor makes a fun gift when paired with shot glasses and can also be used as an extract in baking for those who do not drink. Aside from the holiday season, the whisky makes a soothing get-well gift for a friend suffering a cold or the winter blues; use it as the base for a hot toddy. 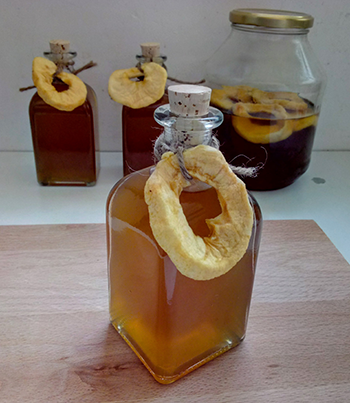 For Rosh Hashanah, pour into little decorative bottles with stoppers and decorate with dried apple slices. In a small sauce pan, bring honey and water to a boil. Turn down heat and continue to cook until the honey has completely dissolved (not more than a few minutes). Let syrup cool. In a large bowl, mix the whisky with the honey syrup. Evenly distribute in jars using a ladle and funnel, then decorate as desired. Let steep for 3 days before drinking. 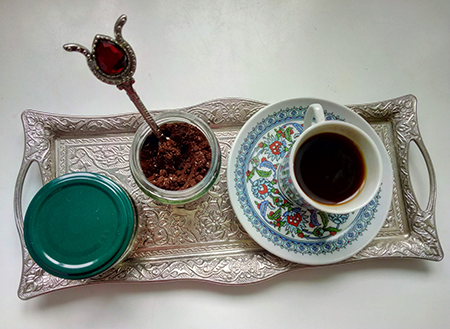 Traditional Turkish coffee is like a strong espresso mixed with lemony cardamom or other aromatic spices. 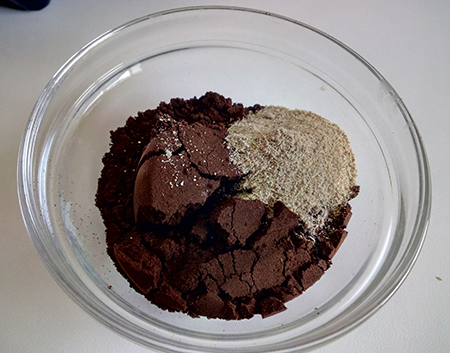 It can be slowly cooked on a stove top with water and sugar in a special pot called a finjan or stirred directly into hot water and given time to steep as the grains sink to the bottom and form a kind of “mud.” The latter technique, which takes two to three minutes, is usually done in a small glass cup and is the typical choice for Israelis looking for a fast jolt of caffeine to get them through the work day. To achieve an authentic taste make sure you use Arabica beans that have been very finely ground, just before assembling the packages. The desired result should be coffee that looks like a dark cocoa powder and smells richly aromatic. Aside from drinking, this coffee mix is excellent used in any chocolate cake or brownie recipe, and simply stunning when added to chocolate chip cookie dough. To keep large batches fresh in between uses, store in the freezer or in an airtight container. Makes enough coffee mix for about four, 2-ounce jars. Mix the coffee and cardamon together, then package as desired.